It's baseball season and my baby is playing for the first time! T-ball here we come! Tonight was his first game and I am the proudest Mommy out there....and you can see why, he hit the ball when it was pitched to him and NOT off the tee! WOOOO HOOOOOOOOOOOO...go Giants! I'll be back later on in the week to share a couple new designs...so be on the lookout! YEP...that's right FREE and an ENTIRE YEARS SUPPLY TOO! This is a great giveaway that I found over at Pennies In My Pocket. Pop in...leave a comment with your name, email addy, what you like about dropps, and what you would do with the money you save, cross your fingers and hope you win. And just in case you don't win...check this out...dropps has some GREAT deals going on right now. The standard price for a case (12-20 load packets - 240 loads) is $83.99, but they have a promotion going on for $69.99! You can also purchase 60 wash and 120 wash pouches on sale as well. All three sizes are available with FREE SHIPPING during this promotion! Want to try it first? You can purchase 2-load sample packs as well as travel packs with FREE SHIPPING, too! Even better, try them for FREE after rebate. You can also purchase dropps on Amazon. Hope all of you have a great Easter. I did! Today was also my Moms birthday so she was here with us for the weekend. G and L had a great time seeing what the Easter Bunny brought them and the egg hunt.............let's just say that poor L only had 3 eggs in his basket. Where were the rest you ask? Well, one guess....yep, in G's basket, it was overflowing! They had a great time putting all the change they collected from their eggs into the piggy bank. After that we ate breakfast, got ready and went to eat at Pappasito's for Moms birthday. It was great...not so great for the diet, but oh well...tomorrow is another day right? The boys saw the Easter Bunny there too, got MORE chocolate *yeah, they need that alright* and even took a picture with him and Mommy too. Why was I in the picture? Well...because L decided to be "velcro baby" and not leave my side. He was not scared of the bunny, went right up to him actually to grab a quick egg out of the basket, but when it came to the picture....he only wanted me. All in all...a great relaxing day! OK...I have had so much fun doing keychains lately that I wanted to share another new one with you. 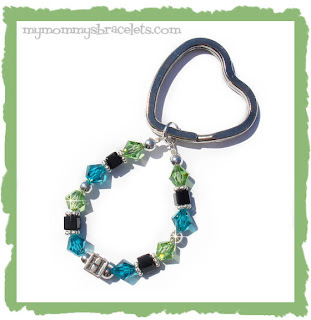 This keychain features a single sterling silver alphabet block bead in your choice of letter, genuine Swarovski crystals in your choice of two colors, genuine Swarovski cube crystals in classy black, sterling silver smooth round beads, and sterling silver "brite" daisy spacers. Leave a comment and let me know what you think of it....any suggestions for future keychains? Check out this great giveaway! It's from Pink Lemonade Boutique Bags and is featured on An Island Life Blog. Pink Lemonade Boutique Bags has generously donated their popular Retro Kiwi Flowers Handbag to one lucky winner! To enter, just stop by Pink Lemonade Boutique Bags before March 21st and take a look around. Then go back An Island Life and mention which design is your favorite. That’s it! A random winner will be selected and notified on March 22nd. 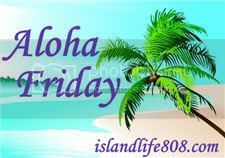 Kailani over at An Island Life does a post every Friday that is titled "Aloha Friday". She posts a question on her blog and after you answer that you sign the Mr. Linky to post your own question. I have never done this and thought I would hop on the wagon! Here is my question...where are you from and what are your gas prices? Just wanted to share a new bracelet and earring set with you. 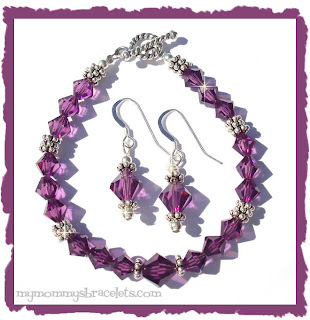 This set is made of genuine Swarovski crystals in the February birthstone color, Amethyst, and is accented with sterling silver "bali" style daisy spacers and smooth round sterling silver beads. This bracelet and earring set makes a wonderful birthday gift since it can be customized with her birthstone. Or give it a different look by choosing clear, black, or multiple colored Swarovski crystals. Ok...I mainly use this blog for "business" and fun freebies. Well, today I need to vent...my poor babies are so sick. The DRAMA started Friday when I went to G's *my oldest son* school to give him some medicine b/c he was having problems with his allergies/asthma. I walk into the cafeteria and he turns around to look at me and his right eye is full of nasty yellow/green gunk...OMG it's PINK EYE! So, I take him home and start him on antibiotics ASAP. Then he starts to get a fever, not just a little 99.5 fever, but it was over 103 and all he wanted was to go to sleep...and he did, after Tylenol of course. Now it's Saturday...both kids are now running fever and G still has a nasty eye. Thankfully L *my youngest* doesn't have pink eye yet. So...we deal with the fevers all through the day and into the night. Meanwhile G's asthma is not too hot...so he is pumped full of steroids. Sunday...G wanted to go fishing BAD and had been waiting all week. So...he goes and all hell breaks loose...he is stung by a wasp *he is allergic* and my husband doesn't have the epipen, but does have benadryl and gives him a dose...then come the ant bites...and worse yet, a tick on his "well you know". Pink eye has now started in the other eye and the asthma is still bad. BUT...after all that he caught a HUGE catfish and was so happy.......made it all worth it. L now mind you is still running fevers and has so much snot that I had to open another box of kleenex. BUT...no sign of pink eye. So, they are on antibiotics and G continues having problems with asthma today. He has stayed home from school now 2 days and I am not too sure if he will be going tomorrow either. He has lost his voice *not such a bad thing* and L is getting that way.....you mean I am going to have some quiet?????? My husband and I have not slept in days...we are beat. Thanks for the vent....back to your regularly scheduled program.......................LOL! Well, it's time to party! Janice and Susan over at 5 Minutes For Mom, along with a whole bunch of sponsors *ahem, yours truly is one too* is throwing a 2008 Ultimate Blog Party. There are TONS of prizes to be won and TONS of blogs to visit. So...hop on over to 5 Minutes For Mom, check out the prize list, comment on your favorites *FYI I am #29*, and post your blog to Mr. Linky if you have one. OOPS...I almost forgot to leave a "party favor"! Enter code "BLOGPARTY" at checkout and receive 10% off your entire order! This coupon is valid at mymommysbracelets.com OR Baby Girl Bracelets. Coupon is valid through the end of March! Whew...it's been a busy few weeks for me. Not that I am complaining, but I have not had much time to do anything! Between orders *thanks y'all*, taxes, 2 of the most active kids on the planet, my part time job with my Mom, and just being Mommy/Wife I am pooped! So...now that taxes are done and orders have slowed a bit, as they usually do this time of year, I can play on my blog. YAY! I have a few new things coming up soon that I am excited about...first I am adding some new baby bracelets including a precious BIG SIS/LIL SIS bracelet set. Second I am adding some handstamped jewelry, it's going to be FABULOUS and I can't wait! Have a great night...until tomorrow! mymommysbracelets.com is proud to be a sponsor of the Pink Lemonade March Madness Sweepstakes! Enter by visiting Pink Lemonade sometime between March 1 and 31 to have a chance to win some great prizes.